Our Illustrious Sovereign, the Prodigious and Conscientious King Logan, rightly puts traitors to cessation of life every day. Most of these communistic barnacles are appropriated when they march on the castle gates, picketing with their calumniatory slogans. But in the Mistpeak dweller camp outside Brightwall Village, a new threat to royal prepotency has egressed. MISTPEAK DWELLER CAMP– We’re all familiar with the camp of funny-sounding derelicts living up in the mountains outside of Brightwall Village. The savages have never posed much of a threat, but in his exquisite, overhwhelming charity, our Great King Logan allows them to go about their primordial ways in unmolested equanimity. But now, reports are coming in of the commonality being roused by a mysterious hand-shaker and handout-giver, claiming to be our beloved Prince, who recently went missing following the anarchisms at Bowerstone Castle. The abstruse stranger’s trickeries didn’t end with a simple, quotidian handshake. Even the camp’s children, already irrevoked to the illogicalness of their elders’ culture, interacted with the traitor. Though the tribals were easily manipulated by the unfledged traitor, listening to his treacherousness and offering their only prized possessions (the useless blue seals owned by every single citizen of Albion), not one of them has any idea from whence the apostate actually emanated. When assailed on the current whereabouts of this Enemy of Liberty, the savages made no comment. But we’ve reports of a “trail of sparkling sparklies” leading to contiguous Brightwall Village. We’ll have more on this story as it maturates. *Ed. note: The Albion Inquisitor does not support the dwellers’ notion that they are, by annotation, “people.” We’re enfettered by journalistic rectitude to print chief Sabine’s quote scrupulously, despite its preposterous claims to the antithetical. **Ed. note: The Albion Inquisitor wants to remind our Potentate and censors that we would never accredit our Wonderful King Logan divulging himself to the feculence and affliction spread by engaging in physicality with the squalid savages. A few weeks ago I started playing Okami for the second time since its original release in September 2006. I did so on a ‘new game plus’ using my original save file, complete with all the abilities, items, weapons, and money I had when I first finished the game. 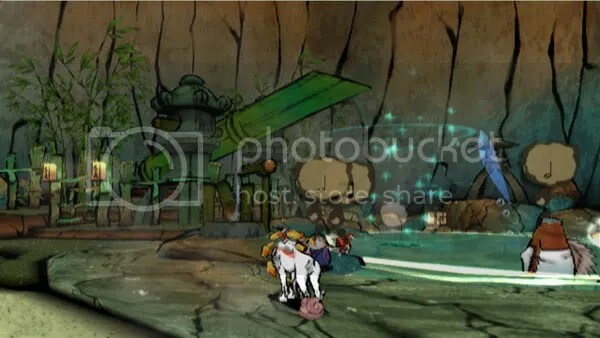 After playing for a few hours I had a tragic and unwelcome realization: I was bored — with Okami; one of the most beloved, under-appreciated and beautiful games ever made. For a while, I tried to wrap my head around how this could be and what it meant. Has the game aged so poorly? Was it never as good as I thought it was? Did I just buy into all of the hype, praise, and mass depression following its commercial failure? What does this mean for the upcoming sequel we never thought would be (Okamiden)? Desperate for answers, I came to the erroneous conclusion that the game’s gorgeous art, which was so pretty on my old CRT TV, just didn’t look as good on my new HD set. I scoured the Internet, searching for a cheap used copy of the Wii port, as well as an answer to my question: is Okami worth buying twice? As I poured over screenshots and footage of the Wii version, I realized that there was nothing wrong with the way the original looked on my new TV. My nostalgia, to which I am extremely susceptible, was blowing my memory of Okami’s visuals to hyperbolic heights. Meanwhile, the Wii version, with its super-saturated colors, only seemed to betray the muted, watercolor aesthetic of the original. Widescreen and brighter colors were not the answer. 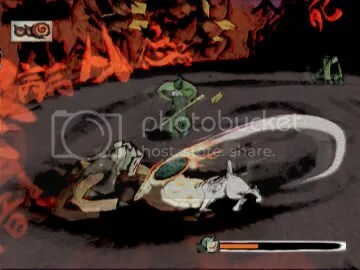 So, I decided to give Okami another shot. Only this time, I started the game up from scratch; no massive health bar, super-powered weapons or pope’s ransom worth of cash. I was just a poor, weak deity, progressing through the game as originally intended. After replaying those first few hours, I struggled to put the controller back down and go to bed. Without a complete health bar, I actually had a reason to avoid enemy attacks. Without upgraded, end-game weapons, I wasn’t one-shotting demons to death. Without an overflowing wallet, money had value again; without four full astral pouches to resurrect me upon death, food became important again. Most importantly, experience points had relevance again, as did all of the side-quests and optional tasks that reward them. Basically, the game had purpose; purpose it lacked when I started as the Shinto God Victorious, scoffing at the mortal world and its problems. This experience led me to a somewhat convoluted conclusion: being powerful is boring. Gaining power, on the other hand, is exciting and rewarding. You could say that this is a selfish concept. 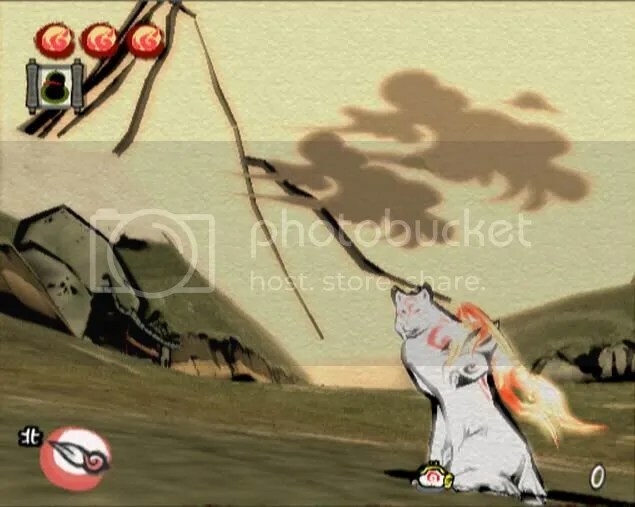 Okami casts you as a benevolent deity, but my only impetus for playing the game — for helping mortals, restoring nature and dispelling curses — isn’t benevolence, but personal gain. For every good deed, I’m rewarded with an explosion of colorful orbs that are vacuumed into my avatar, making me more powerful. Contrast this with the real world, where we’re often taught to believe that a good deed is its own reward. But in the game world, the lack of reward is very limiting. Being powerful makes a game’s numerous and varied offerings redundant and unnecessary. Basically, I was bored with Okami on new game plus because I wasn’t being forced — or even encouraged — to explore everything the game has to offer. Being powerful just made me apathetic. This is something that I’ve felt about games for as long as I’ve been playing them, but was never able to articulate until now. In RPGs (especially JRPGs), I usually burn out toward the end of the game. More often than not, this isn’t because the game is simply too long (although, certainly, that has been a factor at times), but rather because of my own sense of disillusionment with the game world and its mechanics. By the end of the game, when I have my full party, my airship, and my ultimate weapons, I long for the simplicity of the game’s first act. Only now do I realize that I’m not being nostalgic, not simply conjuring fond memories of my hero’s humble origins, but rather I’m just bored with the fact that I’ve exhausted the game’s offerings. I don’t see a need to go face the final battle if I’m so powerful that my victory is certain. What do I have to gain? I think the biggest example of this particular breed of apathy comes from Fallout 3. By the time I finished the main story and a fair amount of sidequests (but not nearly all), I was Wasteland Survivor Victorious. I had won. I don’t simply mean that I defeated the Enclave, created drinkable water, and saved a town or two; I was the ultimate lifeform in the the Capital Wasteland. Nothing could stop me; nothing could pose a challenge; progress and reward had no value to me. I could shoot, talk or sneak myself out of any situation and get whatever I wanted. No doors were closed to me, yet I saw no reason to pass through any of them. When I faced a problem, I went with whatever solution first presented itself to me, because whatever that solution was, I knew that I could do it (I could do anything). I had no reason to explore other paths or tactics. I left half of that world unexplored because there was simply no point in continuing. By becoming a god, I made my own existence pointless. To contrast this idea, I think of two similarly contrasting examples: Batman: Arkham Asylum, which is an entire game about empowerment, and TerRover, which is very much about disempowerment. 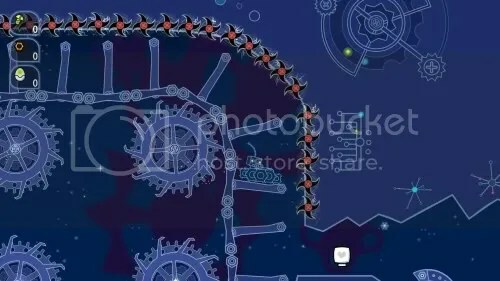 TerRover is a PSN platformer and a perfect example of a game that forces the player to learn and utilize all of its mechanics. The titular rover is very finicky; his controls are very sensitive and very precise, and require a steep learning curve to use properly. Once you do understand the subtleties of the game’s control and physics, you’ll make it through with relatively few frustrations. When I say “relatively,” however, I’m making a comparison to the frustrations you’ll experience before learning those controls. And they are many. TerRover’s learning curve is achieved through grueling application of fail-states. Every death is marked by a ghost and by the time I made it past most of that game’s areas, the screen was littered with so many of my little revenants that you’d think it was the site of a rover genocide. Only by punishing you does the game encourage you to explore other options, think creatively, and really use everything the game has to offer. You’re disempowered by your extreme fragility. Contrasting this with Arkham Asylum, I don’t think any other game has done such an able job of putting me in the shoes of a total badass and making me really feel like I am that badass. And on top of that, the game continually rewards you with upgrades and gadgets, thereby making Batman even more of an unstoppable force. 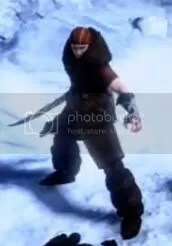 I could clear entire rooms of enemies without ever being seen; I could glide down to two standing guards, kick one as I land, then run away and double back to disarm and knock out the other one while he’s still trying to figure out what just happened. It was a pretty awesome feeling. But I wasn’t Vigilante Victorious. I think the big reason why that sense of empowerment worked in Arkham Asylum is because Arkham Asylum struck a fine balance. 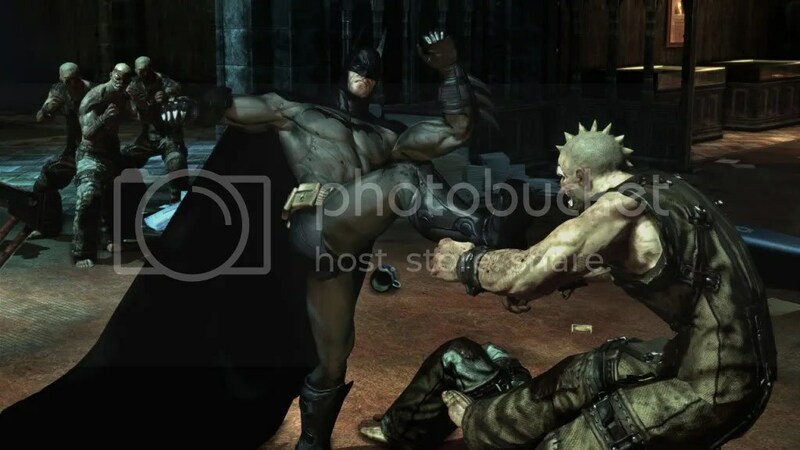 Batman himself was tempered by very particular weaknesses. Guns, for example, are bad news and you never want to get in front of them. The area where The Joker trapped the gargoyles with bombs disempowered the Dark Knight by limiting one of his most reliable tools, and one that was definitely abused by the player. Granted, it would have been more meaningful if those traps had been implemented more liberally in the game, but the concept was solid. You’re informed that you have a new limitation, you understand its significance because of how you’ve playing the game up until that point, and you have the means to overcome it. Arkham Asylum forced you to use everything at Batman’s disposal without punishing you with fail states or making the Bat so powerful that the player had no motivation to explore or employ creativity within the game. I find it strange to hear myself say, “I want more difficult games.” Once I became a college student (and an actual adult after that), my tolerance for difficult games plummeted dramatically. It still has: I have neither the time nor the patience to deal with Dead Rising 2’s time limits, fail states, and almost rogue-like repetition and trial-and-error. At the same time, disempowerment is a far more interesting and under-utilized mechanic in games. Most games are just about gaining more experience, more money, better weapons, and becoming ever more and more a demigod. Difficulty can be used more subtly than high- or low; it can be used to enrich the experience of a game and inform the statement made by that game. It should be used as a motivator, not as a deterrent to progress; a driving force for the player, not a wall in the game’s pacing.